The frozen body of a young woman is discovered on an Arapaho reservation by US Fish and Wildlife Service officer (and skilled hunter/tracker) Cory Lambert (Jeremy Renner), setting the plot in motion in WIND RIVER. The discovery hits Lambert hard. The victim was a friend of his daughter, who herself died under mysterious circumstances a few years back. So when out of her depth FBI agent Jane Banner (Elizabeth Olsen) asks for Lambert’s help, he agrees. Writer/director Taylor Sheridan previously wrote the screenplays for SICARIO and HELL OR HIGH WATER. Like those films, this is an intelligent, adult crime drama with a touch of social commentary. And also like those films, it arguably feels more exceptional than it is simply because the standards have been lowered. I don’t mean to take anything away from WIND RIVER, but this would just have been the level of quality audiences would have expected from a major studio drama in the seventies. Lambert is very much a seventies kind of stoic hero, and it wouldn’t be hard to imagine Clint Eastwood in the role if this had been made back then. Renner is certainly more than up to the task here in the present, though, allowing his human side to come through while at the same time always exuding strength, decency, and determination. Olsen’s Banner is sort of the audience surrogate in the film, letting us see “the rez” through her inexperienced eyes. It would have been nice if she had been given one or two moments to display a little more competence, and thus warrant the compliment Lambert pays her late in the film, but again like a seventies film, WIND RIVER is decidedly masculine. Rounding out the main cast is Graham Greene as the reservation’s chief law officer Ben. It’s a nice little character part, and Greene, perhaps best know for his Oscar nominated role in DANCES WITH WOLVES, does his usual fine work. Although this is his first time directing from his own screenplay, Sheridan has previously helmed the low budget horror film VILE, which perhaps we’ll check out here on the Cleveland Movie Blog for this year’s 31 Days of Halloween. Anyway, he knows his way around a camera, and around actors (Sheridan has also been an actor himself). There’s nothing flashy about his style; just solid, meat and potatoes American filmmaking that puts character, theme, and story front and center, but also knows when to pull the camera back for a nice wilderness shot. There’s still symbolism to be found, though, like the spider crawling over the snow in one brief shot. It’s just not the heavy-handed music video style visuals that have become de rigueur. Us old people appreciate that kind of thing. 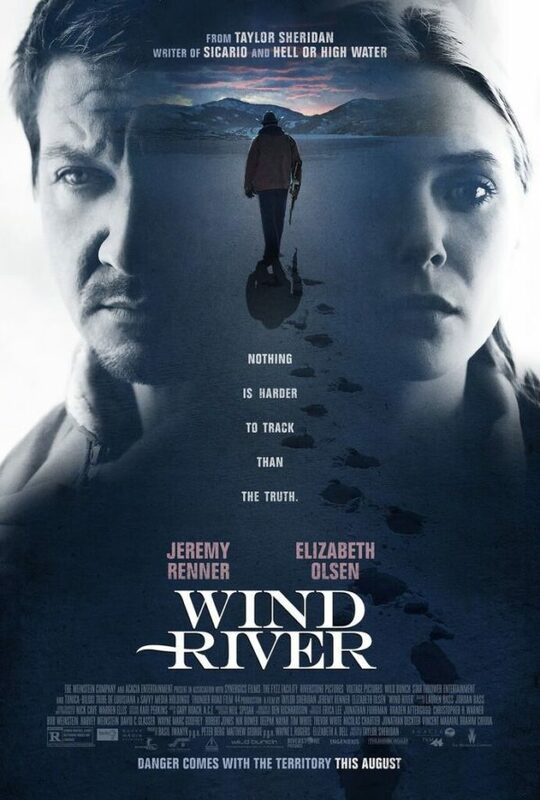 And I imagine the over-thirty crowd will appreciate most of what Sheridan is putting forth with WIND RIVER. 3 out of 4 stars.